SUNNYVALE, Calif., Sept. 26, 2017 /PRNewswire/ -- Accuray Incorporated (NASDAQ: ARAY) announced today that data from a prospective study of 230 men with low-risk prostate cancer showed 98.4 percent had local disease control 10 years after receiving stereotactic body radiation therapy (SBRT) administered with the CyberKnife® System, and toxicity was mild. The study titled, "Stereotactic Body Radiotherapy for Low-Risk Prostate Cancer: A Ten-Year Analysis," was published online in the September 9, 2017 issue of Cureus. "This is a groundbreaking study -- the first to report on the efficacy and toxicity of SBRT in the treatment of low-risk prostate cancer following 10 years of treatment. 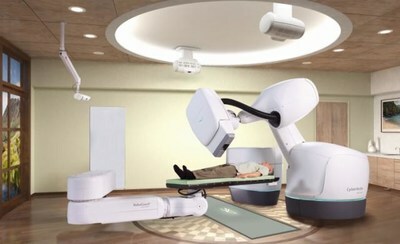 All patients participating in the study were treated with the CyberKnife System, which delivers extremely precise radiation treatments using unique, real-time image guidance and automatic motion correction. The study outcomes were excellent both in terms of disease control and tolerability, and were superior to long-term conventional intensity-modulated radiation therapy, based on results from other studies," said Alan Katz, M.D., Flushing Radiation Oncology. Patient-reported bowel and urinary function scores showed initial declines which recovered to baseline where they remained throughout the remainder of the study period. The prostate gland can move unpredictably throughout the course of treatment, making the ability to track, detect and correct for motion critically important. Throughout the course of treatment, the CyberKnife System continually collects images to determine exactly where the tumor is, ensuring that clinicians deliver radiation exactly where they want it. The System detects the tumor motion and automatically adjusts the radiation beam in real time to match the motion of the tumor, giving clinicians confidence to apply smaller treatment margins and enabling higher doses and fewer treatments. "Following early stage prostate cancer diagnosis men have a variety of treatment options from which to choose. CyberKnife prostate SBRT is increasingly being selected by men with low- or intermediate-risk disease who opt for treatment with radiation therapy," said Fabienne Hirigoyenberry-Lanson, VP Global Medical and Scientific Affairs of Accuray. "This new CyberKnife research adds to the most extensive compendium of published prostate SBRT studies available in the industry. The data continue to validate this precise and accurate approach to the treatment of prostate cancer which offers minimal disruption to patients' daily lives." In this study, 230 low-risk prostate cancer patients received a CyberKnife® treatment dose of 35 Gray (Gy) or 36.25 Gy on five consecutive days. All patients had a Gleason score of six and a PSA < 10 ng/ml. The median age was 69.5 years. The primary study objective was to assess DFS. Statements made in this press release that are not statements of historical fact are forward-looking statements and are subject to the "safe harbor" provisions of the Private Securities Litigation Reform Act of 1995. Forward-looking statements in this press release relate, but are not limited, to clinical applications, clinical results, patient experiences and outcomes, and Accuray's leadership position in radiation oncology innovation and technologies. Forward-looking statements are subject to risks and uncertainties that could cause actual results to differ materially from expectations, including but not limited to the risks detailed from time to time under the heading "Risk Factors" in the company's report on Form 10-K, filed on August 25, 2017, and as updated periodically with the company's other filings with the SEC.